Kevin LaVie practices in the area of admiralty and tort law. He has a very broad-based practice involving nearly all aspects of maritime law including personal injury and death claims; cargo damage claims; dock damage and collision claims; Limitation of Liability matters; charter party and related commercial disputes (including ship arrests and Rule B attachments); insurance coverage disputes; oilfield indemnity actions; pollution matters; and various Coast Guard and immigration matters. His practice covers both the offshore energy or “brownwater” industry and traditional “bluewater” shipping. 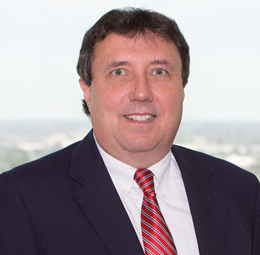 Litigation is a major focus of Mr. LaVie’s practice, and he has tried personal injury and death cases (including Jones Act and 905(b) cases) in all federal courts in Louisiana, many state courts, and in federal courts in other states on a pro hac vice basis. He has also tried a number of cargo damage claims. A subspecialty of his litigation practice involves maritime products liability claims, including machinery and equipment failures. Due to the number of cases he has tried, Mr. LaVie has handled numerous appeals, including over two dozen appeals in the U.S. Court of Appeals for the Fifth Circuit. Prior to joining Phelps Dunbar, Mr. LaVie was with the Terriberry, Carroll, & Yancey, L.L.P. law firm in New Orleans.